Kenny Holmberg, 35, takes over as the field manager for the Spokane Indians for the 2018 season. We are all born with free will, but for some folks, their paths are more preordained than others. Kenny Holmberg was pretty much destined for a life in baseball. Part of it was nature: He’s the son of a baseball lifer. Part of it was nurture: After a tragic accident involving his mother in his childhood, the ballpark became his refuge. 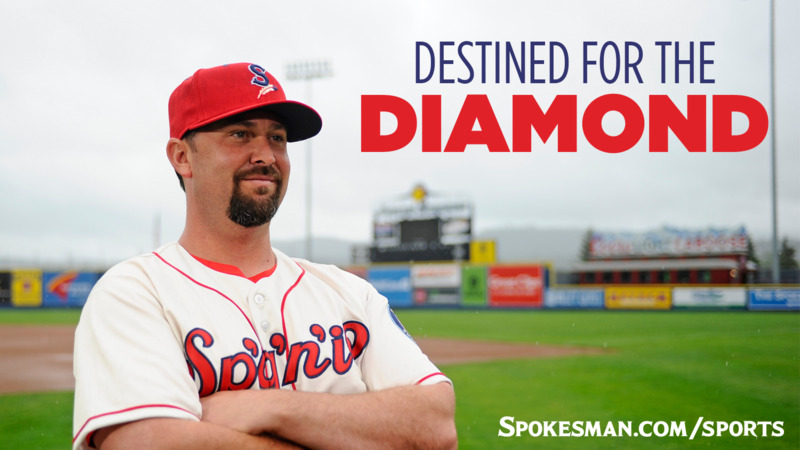 Holmberg, 35, takes over as the field manager for the Spokane Indians for the 2018 season after filling the role of the organization’s minor-league infield coordinator, a position he held the past three seasons. After 14 seasons with Tim Hulett at the helm, this marks the second new manager for the Indians in as many seasons. Last year’s manager, Matt Hagen, was assigned to Low-A Hickory of the South Atlantic League by the parent club Texas Rangers. “I think where we were as an organization there was an opportunity and where I’m at in my career, in my life, the time was right,” Holmberg said. Jared Goedert accompanies Holmberg as the team’s new hitting coach and Jono Armold is the new pitching coach. Athletic trainer Bronson Santillan will also be in his first season at Spokane, while strength and conditioning coach Ed Yong returns for his 10th season with the Indians. All were part of the Rangers’ organization last season. Holmberg sees his new position as part instructor and part mentor. Holmberg previously managed three seasons for the Rangers’ Arizona Rookie League (AZL) and one campaign in the Dominican Summer League (DSL). In four seasons, Holmberg has compiled a record of 127-111. As a player, Holmberg overachieved as an infielder despite his 5-foot-9 frame. He starred at Dunedin HS in Florida and went on to play at Embry-Riddle Aeronautical University in Daytona Beach. He was drafted by the Toronto Blue Jays – the organization his father, Dennis Holmberg, has been employed by for 38 years as a manager, coach and instructor – after high school in the 49th round of the 2001 draft and again after college in the 22nd round of the 2005 draft by Milwaukee. Holmberg spent four seasons in the Brewers minor league system, smacking 34 homers and reaching High-A Brevard County (Florida) in 2008, before retiring as a player and becoming a coach for the DSL Rangers the following season. He managed the DSL Rangers in 2011 and was a coach for the Myrtle Beach (South Carolina) Pelicans in 2012 before taking over as the skipper of the AZL Rangers from 2013-15. Holmberg said managing in the big leagues someday would be a tremendous honor, but he isn’t going to get ahead of himself – or the job right in front of him. But he is bringing a good deal of experience and perspective with him into his new position. His adversity came at an age earlier than most. In 1985, Diane Holmberg was driving with her 5-year-old daughter and 2-year-old son in Syracuse, New York, where her husband Dennis was coaching, when a two-car collision changed all of their lives. The children were uninjured, but Diane’s skull was fractured, leaving her completely incapacitated – in what Kenny Holmberg described as a persistent vegetative state – for the rest of her life. When he was old enough, Holmberg said the ballpark where his dad was coaching would become his version of day care. He was a fixture in the dugout and clubhouse instead of the playground. “In the baseball world, it allowed me to come home from school and my grandmother would take me to the park. I’d sit there all day and all night. I’d go to school and go to the park. It was just the way it was. I knew baseball growing up. That was what I loved. He credits his father for leading the family through difficult times while building a lengthy career in baseball – which is hard enough to accomplish in the most accommodating of circumstances. “I think it’s impressive what he’s done,” Holmberg said of his father. “What he’s dealt with, what he’s gone through. Raising two kids with family and friends supporting him, obviously. He’s somebody to admire. Dennis Holmberg was a fifth-round pick of the Milwaukee Brewers in the fifth round of the 1970 January secondary draft. He played parts of eight minor-league seasons, ending his playing career in 1977 with 45 plate appearances for Holyoke (Mass. ), then a Double-A affiliate of the Brewers. He was hired as manager of Low-A Newark (N.J.) in the Milwaukee system later that season, then in 1979 was hired by the Toronto organization to manage at rookie-level Medicine Hat (Alberta) of the Pioneer League, which started a string of managerial jobs throughout the Blue Jays’ system. In the 1994 and ’95 seasons he finally reached the big leagues, as bullpen coach for the parent club in Toronto. But as with many baseball lifers, another reassignment was waiting for him, and Dennis was appointed manager at High-A Dunedin (Florida) in 1996. He took over at Low-A Auburn (New York) in 2002, where he stayed through the 2010 season. Dennis Holmberg has been manager of the rookie-level Bluefield (West Virginia) Blue Jays of the Appalachian League for the past seven seasons, earning the league’s manager of the year award in 2011 when he went 40-28 and managed future big leaguers Noah Syndergaard, Aaron Sanchez and Kevin Pillar. Not all of Holmberg’s players will be strangers to him – returning Indians Curtis Terry and Isaias Quiroz played for Holmberg in the Arizona League in 2015. Holmberg has also managed future big leaguers Joey Gallo, Odubel Herrera, Jorge Alfaro, Joakim Soria, Neftali Feliz, Keone Kela, Isiah Kiner-Falefa, Nick Williams and Engel Beltre in the AZL. He thinks his perspective of being around the game from a very early age is a benefit to his players, some of whom will be undertaking their first professional experience, and relishes the chance to work with younger ballplayers. “The impact and influence you can make with that first year, getting their first taste of what professional baseball is like, is always unique,” he said. Holmberg acknowledges, though, that maybe even as much as a baseball manager, he also has to be part chaperone and role model. “I love the opportunity,” he said. “I look forward to doing more than just (helping players) throw the ball over the plate, putting the ball in play. “These kids are going to learn how to impact a community. These kids are going to learn how to be good people. Good sons, good brothers, good husbands. And they’re going to play baseball along the way, too. Published: June 14, 2018, 6 a.m.